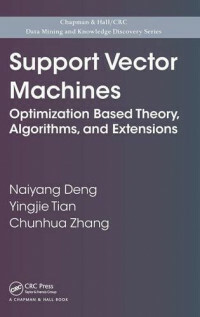 Support Vector Machines: Optimization Based Theory, Algorithms, and Extensions presents an accessible treatment of the two main components of support vector machines (SVMs)âclassification problems and regression problems. The book emphasizes the close connection between optimization theory and SVMs since optimization is one of the pillars on which SVMs are built. The authors share insight on many of their research achievements. They give a precise interpretation of statistical leaning theory for C-support vector classification. They also discuss regularized twin SVMs for binary classification problems, SVMs for solving multi-classification problems based on ordinal regression, SVMs for semi-supervised problems, and SVMs for problems with perturbations. To improve readability, concepts, methods, and results are introduced graphically and with clear explanations. For important concepts and algorithms, such as the Crammer-Singer SVM for multi-class classification problems, the text provides geometric interpretations that are not depicted in current literature. Enabling a sound understanding of SVMs, this book gives beginners as well as more experienced researchers and engineers the tools to solve real-world problems using SVMs.